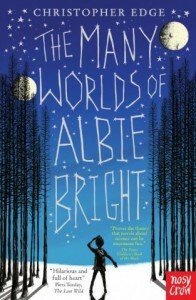 The Many Worlds of Albie Bright, by Christopher Edge, is a quantum fairy-tale. Albie – short for Albert, named after Albert Einstein – is the son of two scientists: his Dad has a popular science TV show, and his Mum worked down a mine, safe from the interfering effects of cosmic rays, probing the universe for signs of the elusive dark matter. But as the book begins, Albie’s Mum has died of cancer. He’ll never see her again. Or will he? You see, the many-worlds interpretation of quantum mechanics (which Albie, being the son of two scientists, has of course heard of) says that there is a possibly infinite number of universes, each one slightly different, in which anything that can possibly happen, happens. Even if it didn’t happen in our universe. The scientific background (quantum theory, Schroedinger’s cat, the Large Hadron Collider, quantum computing) is nicely developed, and while it sometimes feels a little bit like an info-dump, it’s never dull, and always relevant. Of course, when Albie’s experiments lead him to Quantum Banana Theory and quantum-entangled ammonites, it takes a turn for the decidedly unscientific and fantastical, which is a bit of a jolt after the accuracy of the background detail, but without Quantum Banana Theory (which would have been a great alternative title!) we wouldn’t have much of a book, so I think we’ll forgive Mr Edge for a bit of dramatic scientific licence! Of course, with Albie’s loss at the heart of the book, it’s as much a book about family and grief as it is about science and adventure; but the tone never gets too heavy, and there are enough lighter moments to keep the atmosphere from getting depressing. As you’d expect from Nosy Crow, it’s a nicely produced book (with really shiny letters on the cover and the spine!) with a striking cover by Matt Saunders and interior illustration by both Saunders and Spike Gerrell. That may be true, but it makes for a great book anyway.